You might have been keeping an eye out for the best laptop and iPad deals for music makers, but this ‘cyber week’ is also a great time to pick up a music software bargain. DAW developers, plugin purveyors and sample suppliers are all offering discounts, meaning that in-the-box producers can save themselves a serious amount of cash. 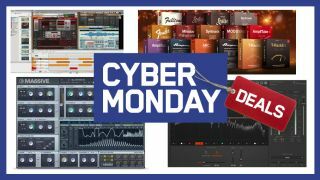 We’ll be scouring the web for the best Cyber Monday music software deals and putting them all on this page. Make sure you keep checking back for the hottest deals and biggest discounts. The best Black Friday iPad deals for music makers: which iPad should you buy? Buy the VSS3 Native reverb plugin for just $109 (down from $199), and the Vintage Guitar Pedal Bundle Native for only $39 (down from $149). There are other savings to be had, too. Heavyocity Punish a whopping 75% off - now just $49! You can grab Serato's DJ Pro, Video, DVS, FX Pack, Flip and Pitch 'n' Time DJ apps in a bundle for just $149.50, or Serato Sample for $49.50.